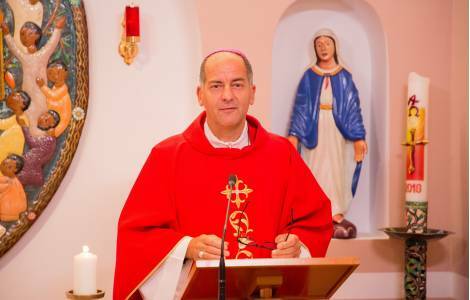 EUROPE/GERMANY - The President of the PMS: "Even from our desks we can be missionaries"
Aachen (Agenzia Fides) - On the occasion of his visit to Missio-Aachen (see Fides 16/10/2018), Archbishop Giovanni Pietro Dal Toso, President of the Pontifical Mission Societies (PMs), this morning, 17 October, presided over a Mass at the headquarters of "Missio" attended by those who work in the offices of Missio and of the German Missionary Childhood (Kindermissionswerk 'Die Sternsinger'). "It is important we continue to rethink of the purpose of our commitment, that we continue to remember that God is the beginning and the goal of our actions and of our existence in general", emphasized His Exc. Mgr. Dal Toso at the beginning of his homily, "It is He who gives us the strength to commit our life according to his will for the benefit of our neighbor. In this light, I would like to thank you for the work of Missio and of the German missionary Childhood". Recalling the feast of St. Ignatius of Antioch, which is celebrated today, the Archbishop referred to his trip to Syria and to the difficult situation of the "brothers and sisters in the Middle East", and stressed: "my first real meeting with Missio Aachen is linked to the difficulties of our Christian brothers in Syria and Iraq, and I would like to mention your generosity also regarding this concern".